On around Talla and Megget reservoirs, and after that short sharp uphill, a long downhill spin to St Mary’s Loch for our picnic lunch! Along to the sadly shuttered Gordon Arms, and up the hill to Traquair and back through Cardrona to Peebles before dark! Those “rolling hills of the Borders” are just as appealing as ever! With trains and boats and youth hostels involved I was surprised how much effort it took to do my first coordinating stint for a Mellow Velo ride. But it was worth it. Perhaps I will be less stressed about it next year. The weather forecast was fairly bleak but that did not put off too many people and we started with a group of 9 at Ardrossan. Unfortunately Emma’s bike had broken while cycling from Largs but, as she had taken on the role of food coordinator she and Joe came on anyway and took the bus to Lochranza from Brodick. It always helps, of course if the Coordinator manages to get on the ferry at the right time so I was immediately ahead of Peter who had organised the trip last year. Arriving in Brodick a quick food stop was required to pick up the rations that had been delegated by Emma. Then, undeterred by the look of the clouds on the mountains around The String we set off at a leisurely but soggy pace. I was not believed when I said that there was sunshine on the other side but I was nearly proved right. As we came down the other side and took a detour to Machrie Moor Stone Circle, the sun nearly shone. Heading back north we were devastated that our first planned tea stop at Machrie Bay Golf Course and Tea Room was thwarted by early closure and we had to continue on our way un-refreshed. We did get a photo of our seal of approval on the way (see photo). As far as I am concerned it is now an annual pilgrimage to Pirnmill Village Store and Post Office where we were served tea but I was dismayed to discover that the Postmistress no longer commutes each weekend from her job in London working in the Cabinet Office as I had told the group. Along with the absence of promised sunshine your leader’s credibility was now completely shattered in the eyes of the group. But there had been no more rain since The String. Next morning Emma (her of the broken bike and catering skills) and Joe took the bus back to Brodick while Melinda felt that as she had been coerced into coming (not true) and as she hadn’t been on a bike much for many years felt that she had done her stint and cycled back there too. So back to 7 of us. The weather looked good and the 9:30 ferry crossing to Claonaig was smooth. When we got to Tarbet there was an agonising decision that there was not quite enough time for a full coffee stop before the next ferry to Portavadie so we sat on the slip and bemoaned the absence of caffeine till the ferry came in. And suddenly the weather was fantastic. On the crossing dolphins were reported behind the ferry (not seen by your leader and no photographic evidence produced) and it was summer for the rest of the trip. A leisurely push over to Tighnabruich and a decent long lunch with puddings and coffees at the Burnside Inn. Any rumours that your leader took a wrong turning into Tighnabruich are mendacious calumnies. I just wanted to show the group the view from there. And then the final slog up the A8009 for the stunning view down the Kyles of Bute which made the uphill grind worthwhile. 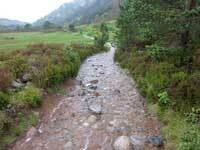 And then a leisurely descent to join the road to Colintraive. No racing for the ferry (No. 4) for a change. It turned out that Jan (remember the lady who appeared and joined us at Lochranza?) had been brought up on Bute so she was able to point out Lord Attenborough’s house and other local sites and gossips before going off to see her mum. With just enough time to grab an excellent fish supper, but not enough for a tea stop, six of us made it to the ferry in good order. And the ferry got in before the train left. So again we were ahead of last year’s trip. Many thanks for great company and an outstanding trip to Keith (who knows a thing or two about bikes and did a great job covering the rear of the party – useful man to have on a trip), Euan , Krystina (always glad to have medical cover, especially as I am still recovering from whooping cough), Erick (we should get his photographs at some point), Anna , Jan (thanks for the local knowledge about Bute), Emma and Joe for catering and Melinda for coming along when she had no idea what she was getting herself into. A great weekend. Why don’t we do it more often? Four of us went on this ride – Jenny, Alec, Paul and Tiana. I discovered somewhat late that the Lockerbie train only took two bikes so the other two folk had to go to Carlisle. Their route to Newcastleton was flatter coming as it was through low lying land to Smithfield and Kershope Forest and then through Liddesdale to Newcastleton. This might be a better route to take if the ride was repeated as the Carlisle trains take more bikes, are more frequent and the distance covered was similar. The forecast was not promising and the two that went to Carlisle started in the pouring rain. 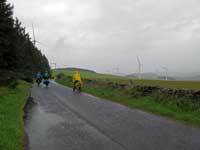 However the two that started from Lockerbie got in an hour of cycling before the showers started. The route took us along the B road to Langholm, a very pleasant ride across undulating countryside, and a good preparation for the grandeur of the hill road to Newcastleton – after fortification at a café of course.. The rain stopped and the clouds lifted to give us good views back to the Solway Firth with the first tints of autumn glowing in the sunlight. 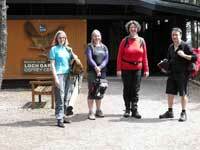 We dropped down into Newcastleton and took a coffee break at the café there. We then headed north along the valley to Saughtree and turned off to Kielder over a surprisingly low pass between the Liddel Water and the North Tyne. We found Alec and Paul already at the hostel. They had beetled along the road from Carlisle to Newcastleton arriving two hours before we did as they had had no coffee stop en route! Sunday dawned a little misty, but we were incredibly lucky and missed the downpours occurring only a few miles to the east of us. We cycled along the South Lakeside Way, a good surfaced, but winding route, to Kielder Dam where we picnicked before heading off on the local route 10 to Falstone and Bellingham. Here there was a clamour for a lunch stop which was opportune as we missed a shower! 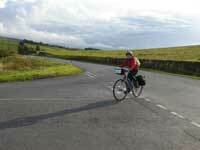 From Bellingham we took the NCN68 to Elsdon where we stopped for coffee at a café stuffed with cycling memorabilia. 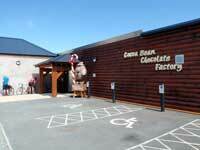 Unknown to us, this was a favourite stop for racing and audax cyclists as well as the potterers like us. From here it was a short pull uphill then a great descent towards Rothbury. The back road kept us above the valley bottom so we had good views until dropping into Rothbury at the last minute. Monday was billed as sight-seeing day but one person was booked on an earlier train. While we were discussing the options two nice young male hostellers suggested she accompany them as they were going to Alnmouth directly. Offer accepted by all of us! The remaining three set off for a quick tour of Rothbury and then to Brinkburn Abbey where we found it didn’t open to 11am! The site comprised a ruined Manor house which was probably made from stone from the ruined priory and a restored church made from the said ruined priory. Very little information about the site (unless you bought the guide). Next stop was Longframlington for lunch at a nice wee café there. 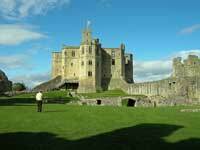 The afternoon took us on the scenic route to Warkworth where we went to the castle. A most impressive monument, the audio guide not only gave the history but chunks of Shakespeare's Henry IV part II as well! From here it was the NCN1 back to Alnmouth. Altogether a lovely ride across the Border hills and Cheviots. Hilly without being exhausting, it takes you through a variety of land uses and villages. There was the carrot of sightseeing on day three to keep you going. The plan allowed for a visit to Alnwick gardens (which are an all day affair) or for a longer cycle ride. Saturday dawned promising so we set out from Auchendinny in sunshine and good spirits despite the poor weather forecast. Seven of us in total but lost two after a few hours, not literally as they’d only they only planned to join us for the morning. Smart move on their part as they missed the climb up the Moorfoots and the next 36 hours of heavy rain! Route to Melrose was good – scenic all the way with no main roads. Also Cloudhouse Café in Stow gave welcome respite. 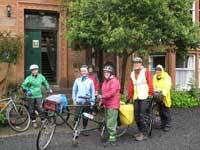 Arrived at Melrose Youth Hostel about 4.30 to meet up with our two intrepid tandem riders who had started half way along the route and arrived impressively early. Hostel was full. We learned later that the Melrose Games were cancelled due to the weather! Burt’s Hotel provided a better than average bar supper at not outrageous price. On Sunday we donned all the gear again (at least it makes the panniers lighter when you wear everything) and followed the Tweed Sustrans Route 1 to Innerleithen, rivers gushing, wheels spraying impressively. The ‘cyclist welcome’ sign on the Whistle Stop café did the job and we arrived home that evening bonded in adversity. Route lovely, company lovely, weather xxxx. Thanks everyone for keeping up your peckers. More of Ross's Pictures are in the Yahoo group site. This year saw 5 of us turn out including one newcomer to MV, Diana Ritchie from Glasgow who hired an excellent confidence building Genesis front suspension bike with 8spd Alfine from Bothy bikes. The weekend started with what seems to be a yearly visit to Bothy Bikes, this year to replace my chain £34 ouch. No you cannot freewheel down that 6 mile slog of a hill!! Saturday started well with wonderful sunshine, really – see the photos! we included a very interesting visit to Loch Garten Osprey reserve where the two chicks were within a couple of days of inaugural flights then got well beyond Nethy Bridge and up into the hills before we saw any rain of note, then about 6 miles from home with the mountain section to go - it made up for it - rivers 2" deep flowing down the paths and one short section 6" deep. Most of us gave up on jackets it was so warm it was easier cycling in the downpour. A short visit to view Loch an Uilean with the surrounding hills shrouded in cloud then a fast downhill to the hostel on much improved paths. Sunday was wet earlier on and it stayed wet - almost continuous rain but nothing like Saturday in volume as we used trails through Rothiemurchus forest to Loch an Eilean then via Inshriach coffee shop and back to Inverdruie to leave Diana at Bothy Bikes as we went for lunch then back to the hostel to gather our belongings and change to dry clothes. Around 20 miles on Sunday ~ 4.5 hours out the hostel. Links to two sets of photos. A wonderful feeling of just being out there. Diana has promised to come back next year with some friends – lets hope she makes it and why don’t you try it – nothing scary involved. 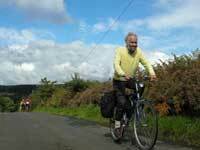 We will even order sunshine for the first time and hope to avoid the perennial visit to Bothy Bikes. Likely dates, 06 th – 08 th July 2012 see you then and don’t say you didn’t get sufficient warning. Four of us met at Uddingston Station. It has a cafe. 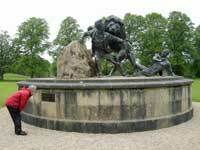 We crossed the Clyde by a footbridge and paused at the David Livingstone Memorial, showing Livingstone mauled by a lion (he survived). Then quickly through Blantyre and slowly up, up, up to the Lanarkshire plateau. Even on a not-too-good day there were good views over Clydesdale. We had a good lunch at the Bully Inn at Quarter. The inn was named after one of Nelson's ships called the Bellerophon, but the un-cultured locals couldn't pronounce it and called it Bully for short. South of Quarter, the plateau is crossed by several rivers, each in a gorge which we had to cross by dropping down to the bottom and climbing up again. There is one each side of Stonehouse, which has a lot of terraces of single-storey stone cottages, now a conservation area, and the piers of a large former railway viaduct. At Netherburn we looked for the PH marked on the map, but it doesn't exist. After that, the weather got nasty (strong wet south wind) and the next level stretch was done in bottom gear. 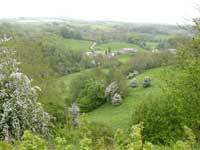 We arrived, rather wet, at the 16th-century Craignethan Castle, built on a rock in one of the steep-sided gorges. No tea room, but a welcome coffee machine and a well-informed custodian. We then continued past Black Hill Viewpoint (no point in going up to it) and above the south side of the Clyde to Lanark, There was a bit of a panic when we saw signs that the B7018 was closed, but we got through all right. 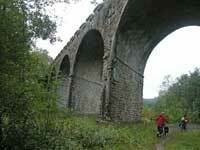 The approach to Lanark is up a 1 in 7 on a busy A road, so we took the Clyde Walkway instead. It is rough, but even if it had been tarred we would have had to walk it because of the gradient. At the supermarket at the very top of Lanark we bought food for the evening meal, then a final drop down into New Lanark and the Youth Hostel. Two of us had the hostel breakfast. The days of "continental breakfast = coffee and croissant" are long gone; a large spread was laid before us, with the message "anything that isn't eaten will be thrown out". What wasn't eaten was made into packed lunches and we hoped that the sun then shining would stay till lunch-time. At Carluke the Kirkton Inn wasn't yet open, but the sun was out. The packed lunches were eaten in the park, then another shower sent us into the inn (by then open) for hot soup. The early afternoon was uneventful. The sun shone but it was cold and windy. 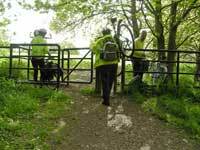 We continued past farmland to Bonkle, with some fine Regency cottages, then through sheltered woods to Kirk o' Shotts. Then the fun started. The forecast for Sunday was for 35-knot winds in the hills, gusting to 50; we met them on the moor road between Kirk o' Shotts and Caldercruix, a lot of which had to be taken at a walk. But at least it was dry and sunny. We entered Caldercruix by the new NCN 75 path beside the Airdrie-Bathgate railway line, and found a welcome but basic tavern by the station. We could have continued on the cycle path towards Bathgate, but a heavy shower and dark clouds to the west persuaded us to take the next train home. The trains on the line hold four bikes with ease. 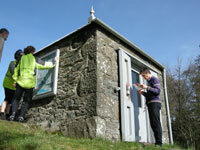 Another beautiful Spring weekend round Loch Tay and Glen Lyon. After our traditional start in Legends Coffee shop in Grandtully, 5 of us set off through leafy Strathtay and on to Kenmore. We discovered the Croft-na-Caber watersports Café had re-opened, so enjoyed lunch there by the shores of Loch Tay. Then breezed along the south Loch Tay road with scenic views to mountains and lochs. 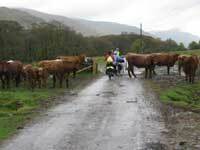 As we cycled out of Killin he caught up with me, and we cycled the last 4 miles to Kiltyrie Farmhouse B&B. Once again, Jane spoiled us with an amazing afternoon tea table “groaning” with homemade cakes, tea and coffee in her conservatory. Later we had a tasty evening meal, followed by relaxing in the comfortable lounge. Down Glen Lyon to Bridge of Balgie – still a favourite spot, sitting outside above the river, with their excellent soups and cakes to savour! Down through Fortingall, with a look at the famous Yew, and on to the House of Menzies just in time for a final cuppa, before our return to Grandtully. Good cycling, good weather and good company!! 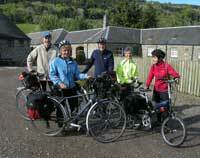 We assembled at Dunblane station, 8 of us, as planned. 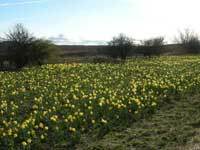 Taking the back road to Braco, we were soon enjoying big views and daffodils. We checked out the Roman remains and the history of the village and then moved on to Aucherarder in time for a picnic lunch in the park and coffee in one of the cafes. When we reached Kinkell Bridge, we took time to admire a beautifully restored motorbike and sidecar. Some riders were entranced and had a long chat with the proud owner. 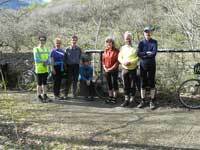 The rest set off east for Findo Gask, a beautiful road with primroses and violets in the hedgerows. After ½ mile on the A9, we arrived in Tibbermore. Gloagchurn teashop offered enticing cakes and, as we predicted a head-wind into Crieff, most of us were glad of the break. Dinner went well. Tiana’s rhubarb and orange cheesecake had survived the ride and was delicious. The room for eight was fine - £15 each. Sunday dawned even sunnier. By 10 a.m., we were at Earthquake House in Comrie learning about the world’s first seismometer and studying the readings from the recent earthquakes in New Zealand and Japan. We were soon on South Earn Road and then joined Route 7 a mile down A84. In less than two hours were at Balquidder Library café for lunch in the sunshine followed by a short visit to Rob Roy’s grave. 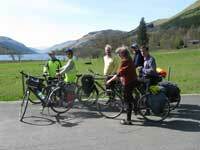 We continued on Route 7, alongside peaceful Loch Lubnaig, where Ross joined us. We had a short stop to admire the Falls of Leny. 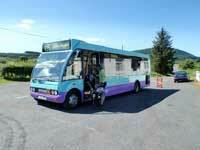 Just before Callendar, at Kilmahog, we took A821, A81 and B822 towards Thornhill – then A84 into Doune for tea. Though main roads these were not too busy. The ride kicked the year off in fine style with an incredible 19 starting at Longniddry, some of whom were new to MV. I had reconnoitred the ride and furnished everyone with the usual amount of detail as to the route, the meal and who was coming. Though you’d not believe it! The weather was good and looked to remain so. We set off happily along the railway path. I was told later that the ages ranged from 3 to 76! The youngest was carried along on a child seat and she pointed out the playparks en route. 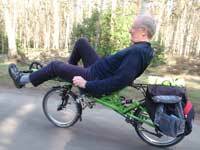 2 recumbents had come along. I discovered that these are slower on rough paths but they kept each other company on the detours! All went well until we were waiting by the Tyne Bridge for everyone to catch up, when we slowly became aware that we were missing 3. Their mobile was switched off so we carried on. After all we weren’t going to miss lunch! It transpired that Bill had had a puncture in Haddington and Isla had demanded a snack and playpark in compensation. They joined us at lunch at the Crown Inn. It was an excellent meal. The menu was not adventurous but the food was exceedingly well cooked. It was much enjoyed and washed down with a glass of real ale. We chatted noisily thereby ruining the other diners’ expectations of a peaceful lunch, and piled outside again at 3pm! Isla was ready for another playpark so the 3 of them decided to take their own route back. The first rebel was Neil who announced he was going direct to Drem! See the next time he makes a comment about MV rides being short…! Ken then discovered he had a puncture and decided he could mend it faster without 13 folk helping so we tried to set off. The local kids had surrounded the recumbents virtually preventing them from leaving. They would have to go direct to the mill in any case so I tried to take the rest via the doocot but most weren’t having it and so we all went direct. Another 2 had gone awol in the kerfuffle but hey why worry! 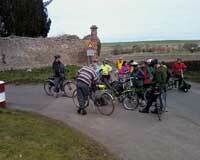 The remaining 11 had a lovely ride up to Newbyth and along the ridge towards Kingston then down to Aberlady. 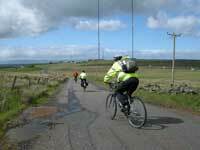 The recumbents plumped for the coast road to Longniddry whereas the rest went the inland route to get the 5.30 train. It was just as well no one wanted to go up to the Hopetoun monument as we found the train already full of bikes! So some of us had an extra 12 miles. While we were there Bill, Kathy and Isla turned up and so did Ken, who, because he missed a turn off, did a longer route and so hadn’t caught us up! 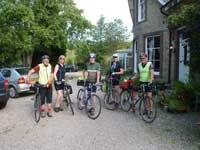 The official ride was just short of 30 miles, though 2 of us did nearer 60! Peter said his route was via Markle, then Athelstanford, Coates etc. His ride started and finished in Edinburgh too. All in all, a grand start to the year. Long may it continue.